Chunky candy bar. A big chunk of milk chocolate filled with peanuts and raisins. 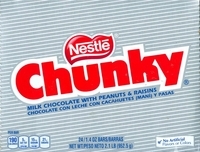 Chunky bars are another old time candy bar from the 50's. What's so great about a chunky bar is they're a chunk not a bar. A little unusual, but great tasting.